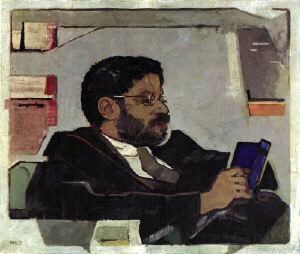 Paul Ehrenfest, painted by Harm Kamerlingh Onnes in 1920. Wednesday evenings in Leiden during the academic year were reserved for the physics colloquium, an institution still flourishing and now named the Colloquium Ehrenfestii. Paul Ehrenfest was the successor of Lorentz as professor of theoretical physics in Leiden. When Ehrenfest arrived in Leiden in October 1912, he had been struck by the absence of a colloquium. There was no regular meeting that brought together students, professors, and research workers in the university laboratories to hear lectures reporting on new research and, especially, to discuss these reports. Ehrenfest felt this absence keenly. Leiden needed such a physics discussion group, and he immediately set about creating one. Within weeks of his arrival the new colloquium was meeting regularly. Within a few months its success was made evident by the creation of analogous colloquia in mathematics and organic chemistry, both of them organized by participants in Ehrenfest's original group. The unique features that distinguished the Leiden colloquium from its many counterparts at other universities can all be traced to Ehrenfest's active presence. Student members of the colloquium had to be admitted by Ehrenfest himself. This could occur quite early in a student's career, if Ehrenfest had reason to think that an invitation to join the colloquium would be properly appreciated. In 1914 he noticed the newly arrived Jan Burgers attending Lorentz's Monday morning lectures, and soon thereafter invited him to the colloquium. Later on the older students were deputized by Ehrenfest to search out bright young students who had not yet come to his attention by taking his courses. But once you were admitted to the colloquium, regular attendance was required. "Ehrenfest even took attendance!". Those who wavered were no longer welcome. Skipping the colloquium was taken as a clear indication that the offender lacked that total commitment to physics demanded by Ehrenfest. "To speak at the colloquium was, for a young physicist, a bit of an ordeal," as Hendrik Casimir put it in his understated way. Ehrenfest demanded clarity, and if the speaker did not provide it himself, he would be helped by pointed questions or explicit suggestions and reformulations. Visiting speakers would be advised: "Bear in mind that we know little, but we understand quickly." He had no fear of asking "stupid questions," and encouraged others to ask them too. "If I've understood it, then so has everyone else," Ehrenfest would say. He would not let a speaker address himself only to the best informed members of the audience. The colloquium was a place for students to learn, and speakers had to recognize that. On an occasion when Werner Heisenberg was talking, Ehrenfest interrupted to say: "No, no. You have to make it clear to me, not to Pauli". George Uhlenbeck captured the spirit of the colloquium in a sentence: "It was an educational experience (sometimes a bit painful if you were the speaker) to hear Ehrenfest summarize the discussion and often the whole talk, so that finally everybody, the speaker included, understood what it was all about". M.J. Klein, in Physics in the Making (North-Holland, Amsterdam, 1989). More info on the early history of the Colloquium Ehrenfestii. One speaker describes his experience. Interview with Paul Townsend, just before his colloquium. 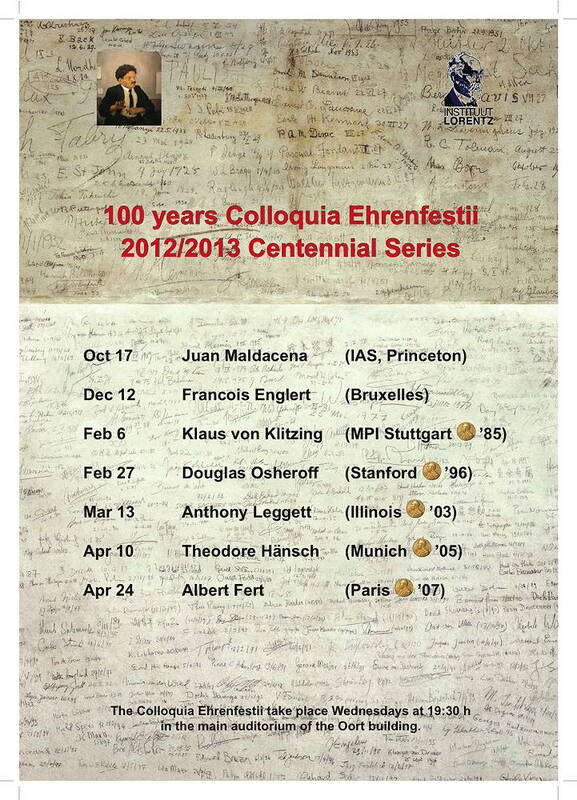 Announcement of the Centennial series of colloquia (1912-2012). After the colloquium, the speaker would sign the wall, a tradition continued to this day. Here is a list of the signatures on the old part of the wall. To activate the magnifying glass, reduce the width of the browser window. You can inspect the signatures from up-close, by moving your cursor over them. The whole wall, including the signatures up to 2004, can be seen here. You might notice a big horizontal scratch near the center in the lower part of the wall. It has a curious history, described in A monument to a resistance fighter.